2016-11-06 ~ National Association of Postal Employees, Tirunelveli Division. The competent authority has ordered that all the Head Post Offices across the country will remain open on 13.11.2016 (Sunday) for exchange of Withdrawn Old Series (WOS) of bank notes in denominations of Rs. 500/- and Rs. 1000/- with new currency/ prevalent notes, and for opening SB Counters. 2. The Head Post Offices should arrange for drawal of sufficient cash from the linked Banks in advance. The purpose of keeping the Post Offices open on 13.11.2016 is specifically for exchange of WOS notes with the new/prevalent ones and opening SB counters and not for other operations. Sufficient number of counters should be operationalized to avoid any kind of inconvenience to the public. The information about availability of cash for exchange purpose may be displayed on the notice board of respective Post Offices well in advance. This may also be widely published through the press. Requirement of staff shall be as per local assessment. 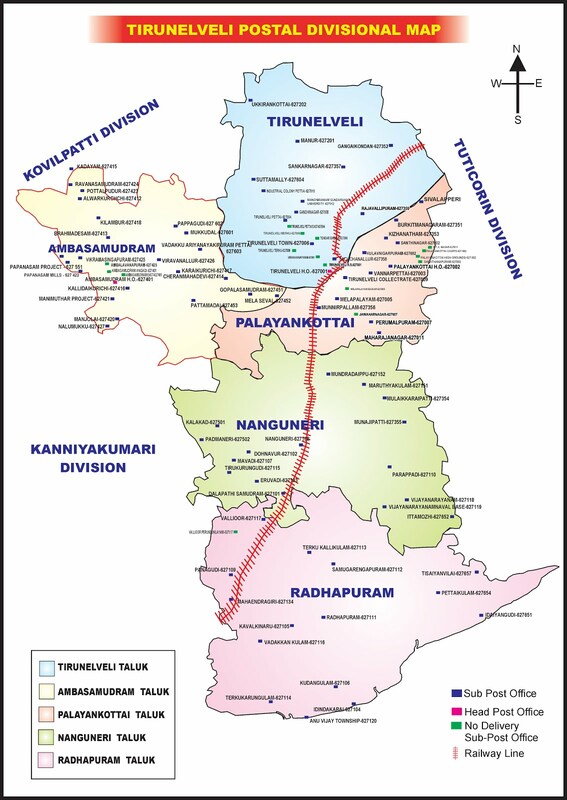 பத்திரிகைகளும் --மீடியாக்களும் மற்றவைகளை ஒப்பிடுகையில் அஞ்சலக சேவையை வெகுவாக பாராட்டுகிறார்கள் . இருந்தால் தானே பழைய நோட்டுகளை மாற்றுவதற்கு ! மத்திய அரசே !இனியாவது எங்களை ஏய்காதே ! ஒதுக்கியதும் இல்லை ! பதுக்கியதும் இல்லை ! Sub: Request to provide a necessary patch in our software Reg. Kindly refer my earlier letter and savingram. Our staff in HO/SOs are finding difficulties while paying cash to the public due to nonavailability of software which alerts to arrest the daily payment of maximum limit i.e Rs.4000 & Rs.20000 per week as in the case of banks. Necessary instruction may kindly be issued to authority Concerned to provide a necessary patch in our software to avoid future complication. Your speedy action is requested in this regard. All Head of the Circles. The implementation of higher allowances under the 7th CPC will be delayed. There are reports that higher allowances under the 7th Pay Commission which were to be implemented soon will be delayed when the situation returns to normalcy. New Delhi, November 10: On Tuesday night Prime Minister took the nation by surprise and announced a crackdown on Rs 500 and Rs 1000 notes with effect from same midnight, making these notes invalid across India. The recent development has no doubt caused inconvenience to common people. But the most effected ones are government employees who have been eagerly waiting for the 7th Pay Commission award which may get delayed following Narendra Modi’s surgical strike on black money to curb rising black money, fake currency, and corruption. There are reports that higher allowances under the 7th Pay Commission which were to be implemented soon will be delayed when the situation returns to normalcy. The top official further added that “the Narendra Modi government is in fear of any eventual incident for a surgical strike on black money in the country and in view of the current scenario, the government has decided to delay the announce of higher allowances”. The Central Government employees unions are pressing hard on the government to announce the higher allowance and they had recently called for a Parliament march on December 12. Earlier there were reports that the ‘Committee on Allowances’ has already given a final touch to its report on higher allowances. The committee met up with the deadline of four months given to it by the cabinet to submit its reports, the top official confirmed. There are reports that the quantum of allowances may not vary from those proposed by the 7th Pay Commission as the committee looking into the issue sticks with the 7th Pay Commission’s recommendations on allowances proposed higher allowances with retrospective effect from August 2016 but the central government employees unions demanded for implementation of the allowances with effect from January 2016. Recently Finance Secretary Ashok Lavasa said that his team is ready to submit its report whenever Finance Minister Arun Jaitley calls up. The committee on allowances was set up July this year in the direction of the cabinet. How do you check for a counterfeit Indian Rupee Note? These notes contain distinct easily recognizable security features to facilitate the detection of genuine notes vis-à-vis forgeries. 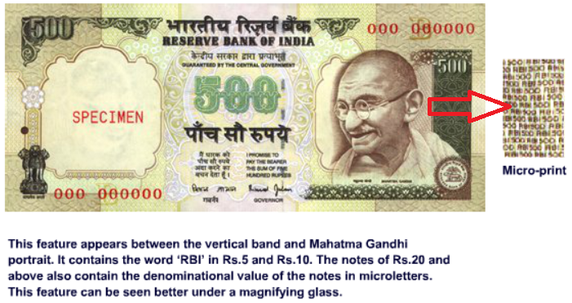 The Rs.500 notes have a security thread with windowed security thread alternately visible on the obverse with the inscriptions ‘Bharat’ (in Hindi), and ‘RBI’. When held against the light, the security thread on Rs.500 can be seen as one continuous line. The security thread appears to the left of the Mahatma's portrait. 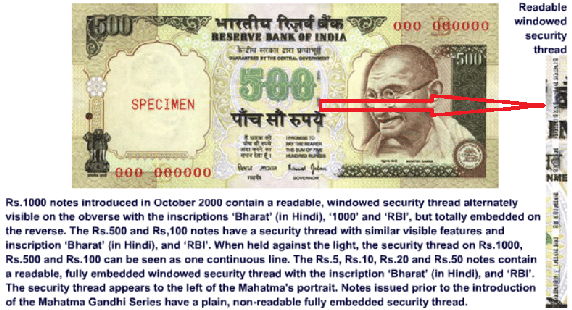 Notes issued prior to the introduction of the Mahatma Gandhi Series have a plain, non-readable fully embedded security thread. 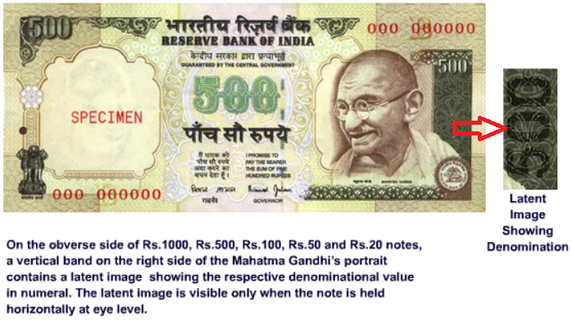 On the side of Rs.500, a vertical band on the right side of the Mahatma Gandhi’s portrait contains a latent image showing the respective denominational value in numeral. The latent image is visible only when the note is held horizontally at eye level. This feature appears between the vertical band and Mahatma Gandhi portrait. The Rs. 500 notes contain the denominational value of the notes in micro letters. This feature can be seen better under a magnifying glass. The portrait of Mahatma Gandhi, the Reserve Bank seal, guarantee and promise clause, Ashoka Pillar Emblem on the left, RBI Governor's signature are printed in intaglio i.e. in raised prints, which can be felt by touch. 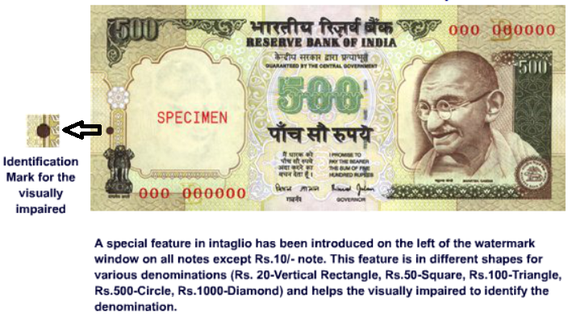 A special feature in intaglio has been introduced on the left of the watermark window on all notes. This feature is in different shapes for various denominations (Rs. 20-Vertical Rectangle, Rs.50-Square, Rs.100-Triangle, Rs.500-Circle, Rs.1000-Diamond) and helps the visually impaired to identify the denomination. Number panels of the notes are printed in fluorescent ink. The notes also have optical fibres. Both can be seen when the notes are exposed to ultraviolet lamp. 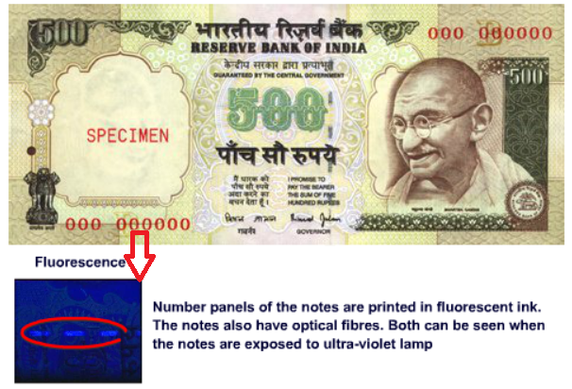 This security feature is incorporated in Rs.500 notes with revised colour scheme introduced in November 2000. 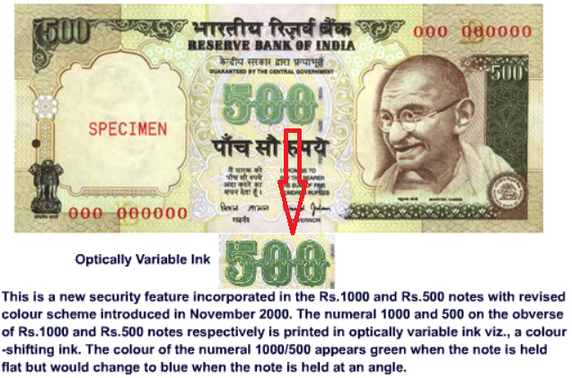 The numeral Rs.500 is printed in optically variable ink viz., a colour-shifting ink. The colour of the numeral 500 appears green when the note is held flat but would change to blue when the note is held at an angle. The small floral design printed both on the front (hollow) and back (filled up) of the note in the middle of the vertical band next to the Watermark has an accurate back to back registration. The design will appear as one floral design when seen against the light. Further dangling the stick, government tonight warned that cash deposits above Rs. 2.5 lakh threshold under the 50-day window could attract tax plus a 200 per cent penalty in case of income mismatch.“We would be getting reports of all cash deposited during the period of November 10 to December 30, 2016, above a threshold of Rs. 2.5 lakh in every account. “The (tax) department would do matching of this with income returns filed by the depositors. And suitable action may follow,” Revenue Secretary Hashmukh Adhia said tonight. Any mismatch with income declared by the account holder will be treated as a case of tax evasion. “This would be treated as a case of tax evasion and the tax amount plus a penalty of 200 per cent of the tax payable would be levied as per the Section 270(A) of the Income Tax Act,” he said. The government has allowed citizens to deposit in their bank accounts old currency of Rs. 500 and Rs. 1,000 denominations, which had been declared invalid in the nation’s biggest crackdown on blackmoney, corruption and counterfeit notes, between November 10 and December 30. Adhia said small businessmen, housewives, artisans and workers who had some cash lying as their savings at home should not be worried about any tax department scrutiny. “Such group of people... need not worry about such small amount of deposits up to Rs. 1.5 or 2 lakh since it would be below the taxable income. There will be no harassment by the Income Tax Department for such small deposits made,” he said. On people resorting to buying of jewelery, he said persons buying jewelery has to provide the PAN number. “We are issuing instructions to the field authorities to check with all the jewellers to ensure this requirement is not compromised. “Action will be taken against those jewellers who fail to take PAN numbers from such buyers. When the cash deposits of the jewellers would be scrutinised against the sales made, whether they have taken the PAN number of the buyer or not will also be checked,” he added. Situation in SO and HOs alarming aaa. Kindly Issue instruction to purchase fake currency detecting machine for relaxing Financial power of SSP/SP aaa. Your Urgent intervention is requested aaa. With demonetisation of Rs 500 and Rs 1,000 currency notes, the government has directed Income-Tax Department to coordinate with all banks and furnish details of individuals who exchange cash amount of Rs 2 lakh and above. “A key reason for scrapping these two currency denominations is to curb the huge menace of fake currency, tackle black money and make India a cashless economy,” said a senior I-T department official. The object was also to make Indians tax complaint, which will eventually lead to higher revenues for government, he added. The tax department has been asked to keep record of every individual along with his/her PAN card details and tally it with the tax filing. Accordingly, the department will impose penalty, which could be between 30 per cent and 120 per cent, depending on the source of income. India has physical cash circulation of Rs 17 lakh crore, of which 88 per cent is Rs 500 and Rs 1,000 notes. Official data suggest that 40 per cent of black money is generated in real estate, while stock market and bullion transactions are other big sources. Estimated total value of gold in India at 25,000 tonnes is Rs 70 lakh crore. India imports 750-1,000 tonnes of gold every year. Among the key reasons that triggered the move was the moderate response to Income Declaration Scheme (IDS), which charged a one-time effective tax rate of 45 per cent on undisclosed income or property, giving a chance to domestic taxpayers to declare undisclosed income or assets by September 30. The scheme offered immunity from prosecution under the Income Tax Act, Wealth Tax Act and Benami Transactions (Prohibition) Act. According to estimates, the government collected only Rs 65,250 crore, resulting in tax revenue of Rs 30,000 crore, about 0.2 per cent of GDP. The government has also tried to deal with the currency problem where 250 out of every 1 million notes are found fake, according to the data submitted by the Union Home Ministry to Parliament on May 3. In 2015, investigative agencies and the Reserve Bank of India had recovered 632,000 fake currency notes with a value of Rs 30.43 crore. In 2015, various intelligence agencies filed 788 cases of smuggling and circulation of fake currency notes, in which at least 816 people were accused. It has been learnt that Delhi and Uttar Pradesh together accounted for over 43 per cent of fake currency recovered. Request for supply of fake currency detecting machine to all HO/SOs at once reg. Sub: Request for supply of fake currency detecting machine to all HO/SOs at once reg. You are aware that our honorable. Prime Minister Shri.Modiji had announced that Rs.500. and, Rs.1000. denomination currency will not be valid from 08.11.2016 midnight. Further, he announced that the exchange of these currencies will be done at banks and post offices. Since the majority of our HO/SOS does not have the fake currency detecting machine, during the exchange of old currencies it will be difficult to detect the fake currency. Hence it is requested to supply of fake currency detecting machines to all HO/SOs on a war-putting measure. A line in reply is very much appreciated. The sudden move to demonetise Rs 500 and Rs 1,000 currency notes is not new. Rs 1,000 and higher denomination notes were first demonetised in January 1946 and again in 1978. The highest denomination note ever printed by the Reserve Bank of India was the Rs 10,000 note in 1938 and again in 1954. But these notes were demonetised in January 1946 and again in January 1978, according to RBI data. Rs 1,000 and Rs 10,000 bank notes were in circulation prior to January 1946. Higher denomination banknotes of Rs 1,000, Rs 5,000 and Rs 10,000 were reintroduced in 1954 and all of them were demonetised in January 1978. The Rs 1,000 note made a comeback in November 2000. Rs 500 note came into circulation in October 1987. The move was then justified as attempt to contain the volume of banknotes in circulation due to inflation. However, this is the first time that Rs 2,000 currency note is being introduced. While announcing currently circulated Rs 500 and Rs 1,000 notes as invalid from midnight on Tuesday night, Prime Minister Narendra Modi said new Rs 500 note and a Rs 2,000 denomination banknote will be introduced from November 10. Bank notes in Ashoka Pillar watermark series in Rs 10 denomination were issued between 1967 and 1992, Rs 20 in 1972 and 1975, Rs 50 in 1975 and 1981 and Rs 100 between 1967-1979. The banknotes issued during this period contained the symbols representing science and technology, progress and orientation to Indian art forms. In the year 1980, the legend Satyameva Jayate -- 'truth alone shall prevail' -- was incorporated under the national emblem for the first time. 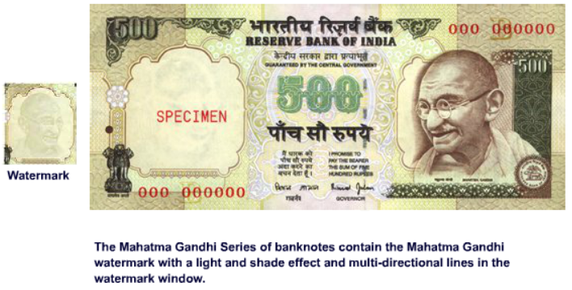 In October 1987, Rs 500 banknote was introduced with the portrait of Mahatma Gandhi and Ashoka Pillar watermark. Mahatma Gandhi (MG) series banknotes - 1996 were issued in the denominations of Rs 5, (introduced in November 2001), Rs 10 (June 1996), Rs 20 (August 2001), Rs 50 (March 1997), Rs 100 (June 1996), Rs 500 (October 1997) and Rs 1,000 (November 2000). G/S NAPE Gr- C Letter to Secretary on Removal of point system in GDS Compassionate Engagements. Sri.D.Kishan Rao G/S, NAPE Group -C Letter to Secretary,Department of Posts for removal of Point system & reconsideration of previous rejected cases in GDS Compassionate Engagements. National Association of Postal Employees Group - C & National Union of Grameen Dak Sevaks Memorandum to Chairman ,GDS Pay Committee. Rs.50, 000 or the actual price of a PC, whichever is lower. .2. These orders will take effect from the date of issue of this O.M. The cases where the advances have already been sanctioned need not be reopened. 3. The other interest bearing advances relating to Motor Car Advance and Motorcycle / Scooter Moped Advance will stand discontinued. 5. All Ministries/Departments are requested to bring the amendments to the notice of all its attached and subordinate offices for their information.